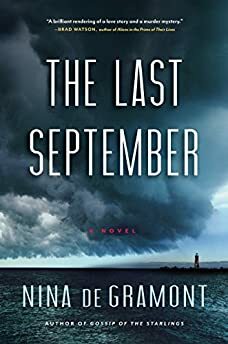 Largehearted Boy: Book Notes - Nina de Gramont "The Last September"
Book Notes - Nina de Gramont "The Last September"
Nina De Gramont's The Last September is a compelling and impressive literary mystery. "Nina De Gramont's The Last September portrays an immediately gripping world of secrets, trauma, and conflicting loyalties. Spanning mental illness, the meaning of family, and the lengths we go to for love, this novel begs to be read in a single sitting. . . A literary novel of both suspense and emotion, this flashback-filled murder mystery has broad appeal." I don't think of myself as a moody or tragic person, but I somehow tend to write moody and tragic books. I like to read them, too. My favorite books are heartbreakers, and when I put together a reading list for a literature class I'm teaching, I've learned to go back over it and make sure I'm not overloading the students with sorrow. One of my favorite lines from any review of one of my books is, "The novel should come with a disclaimer that readers who are shy about public sobbing should avoid cracking this one open on public transportation, in waiting rooms or during classroom silent sustained reading times." The thing is, there's beauty in sadness, and something cathartic about feeling another person's tragedy in our own bones, the way we do when we hear a sad song, or read a sad book. My new novel, The Last September, begins with a brutal murder and ends by revealing the culprit. But to me more than a mystery it's a love story – so despite all the sadness there are happy moments too, not just the ones that occur but the ones that are longed for. So I think an eclectic playlist is needed, one that captures some of the hope that makes loss ultimately painful. Each of these pieces could stand alone, but Copland meant them to be listened to in a cycle. It's his longest work for solo voice, a good companion to the first person narrative of The Last September. In my novel, Brett -- the narrator -- is working on her PhD dissertation, and her topic is Emily Dickinson's letters. Each section of the book is prefaced by a quote from Dickinson's poems or letters, and in an early version I used lines from one of the poems Copland chose, "I felt a Funeral, in my Brain". Dickinson's broad body of work focuses on death, unrequited love, the ways language can slant or change emotions. Like Copland's work, it can seem insistently, incongruously contemporary, and it reads like a delicious arrow to the heart. This is about the happiest song I know. Sometimes I search for it on my real playlist if I need to be zapped out of a funk. The first chords so beautifully capture all the excitement you can feel when you've fallen in love and absolutely know that feeling is returned. When I was a teenager one summer on Nantucket, I would ride around at night with my friends Leslie and Kate, windows down with the salt air rushing in, and we played this song over and over on a loop. It's buoyantly, irresistibly joyful. If ever there were two songs to put side by side in total opposition, it's "Jump for Joy" and "Lost Cause." I'm the kind of writer who needs silence to work – I can't even have classical music playing. But my husband, also a writer, chooses an album to listen to while he writes a book and plays it again and again. When I was first working on The Last September, he was writing a book and listening to Beck's album Sea Change. I would ask him to turn it down so I could concentrate, but also because it made me want to die. I say this as the highest compliment – it's a beautiful album, incredibly so. But listening to it is like having a fist closing around your heart. The sorrow is so palpable there are certain songs – like this one – that almost sound like dirges. Very difficult to hear this song and not start dancing, yet there's so much longing in it – every word a plea. A voice so full of love that only wants it returned, which is perfect for how my narrator, Brett, feels about her husband Charlie – before and even after they're married. I love you so much – please, please, love me back. "Do you realize that you have the most beautiful face…Do you realize that happiness makes you cry? Do you realize that everyone you know someday will die?" I love this song. There's an otherworldliness to the music itself, and at the same time it's bouncy and light. The lyrics do what I'm doing here with my songs, they shift between joy and sorrow. I also appreciate that most of the lyrics are questions, which is something I always tell my students – any piece of writing is a conversation between the writer and the reader. You want to make sure you don't answer all of the questions you pose. Leave room for the reader to answer in her own mind. Heartbreak, sorrow, love, loss. The instrumental alone will slow down your heart. Gorgeous dirge. I love it. I have to include this one because it's the only song referred to by name in the novel and I insult it. "Bad music blasted from speakers, the first chords of 'Smoke on the Water.'" When my daughter was little, I was surprised by how many of her friends who were taking music lessons – at the age of six or seven – could play the first chords of this song perfectly. It's one of the most immediately recognizable musical intros. The song appears in my novel during a sort of dream carnival, and it is classic festival music – something celebratory about the music itself, even though it's about a festival burning to the ground.